BOSTON (Reuters) - A Republican former hospital executive has pulled into a statistical tie with Massachusetts' Democratic attorney general in the race to be the state's next governor, according to a Boston Globe poll released on Friday. 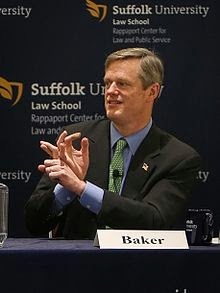 The poll showed Attorney General Martha Coakley holding the support of 39 percent of likely voters, while Republican Charlie Baker had the backing of 36 percent, a 3 percentage point gap that is within the poll's 4 point margin of error. That finding, based on a telephone poll of 605 likely voters on July 7-8 and 13-5, is the closest the two have been in any major survey conducted in the run-up to the November election.